Grevillea species, are native to Australia, New Guinea and also New Caledonia. Most Grevilleas found for sale in your local nursery are from Australia and are bred in Australia. 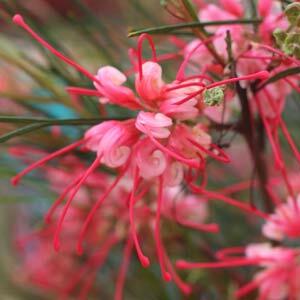 Grevillea ‘Robyn Gordon’ in well known for its long flowering period. Grafted Grevillea are now appearing on the market. The latest addition are weeping standards, a really attractive alternative. Long flowering, easy care, low water requirements and bird attracting, Gevilleas are are also great bird attracting plants as well as making good informal hedges. Grevillea Robyn Gordon is one of the better know cultivars along with Grevillea ‘Honey Gem’, ‘Bronze rambler’ and ‘Moonlight’. Specialist Grevillea Nurseries and Australian Native plant nurseries can also supply grafted and weeping grevillea plants. Some species are longer flowering than others and length of flowering will depend on the climate. The warmer the winter the longer the flowering period. Best Long Flowering Grevillea Varieties. Grevillea come in many forms, from low growing ground cover types to large trees. Prostrate forms such as Grevillea lanigera ‘Prostrate Form’, Grevillea thelemanniana ‘Prostrate form’ and Grevillea obtusifolia ‘Prostrate form’. Trees of 8m and more such as Grevillea barklyana and Grevillea robusta or Silky-oak which will grow to almost 30m. Grafted Grevilleas such as the Grevillea treueriana that is pictured top right, are increasingly popular due to improved disease resistance and improved forms, Richard Tomkin of Changers Green Nursery is a leader in this field. Some species such as Grevillea laurifolia, Grevillea plurijuga, and Grevillea tenuiloba are excellent ground cover plants. Weeping Grevilleas are also now available, these are created by grafting prostrate forms onto upright rootstock. Grevillea ‘Honey Gem, Grevillea ‘Ivanhoe’ and Grevillea hookeriana are all excellent screening plants. Grevilleas need a well drained soil and resent being moved. 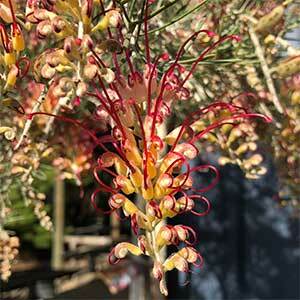 Grevillea are a evergreen hardy native plant, many are bird attracting due to the nectar in the flowers. All species are are reasonably drought tolerant once established. They grow well in a sunny position, a well drained soil. Some deep watering 3-4 times a year will help promote flower growth. The spider like flowers appear from late winter through spring, the prickly foliage of provides protection and a safe nesting place for native birds. The famous ‘Grevillea Robyn Gordon’. 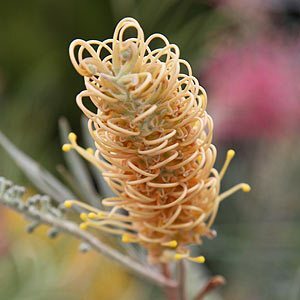 Grevillea intricata is a cream flowering species with a dense spreading habit and attractive foliage. Grevillea “Honey Gem” is a long flowering hybrid that may be pruned heavily if required.